When given a three-day weekend, we jump at the chance to GO! On Thursday we hopped on the 7:30 p.m. over night/ sleeper train out of Bangkok and headed north for 12 hours. 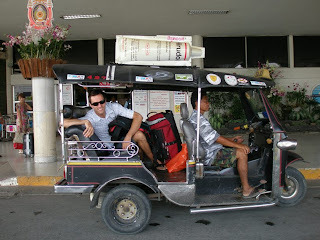 The next morning, after sleeping with a "car load" of non-English speakers, we arrived in Chiang Mai. Looking out our window, we saw green hills, random Thai men standing on the train tracks, and lots of stray dogs. Curiously, we wondered what this weekend would be like. The second we stepped off the train, we were instantly bombarded with tour guides shoving their fliers in our faces, drivers motioning us to get in their Tuk Tuk's, millions of signs for hotels and guest-houses that offered AC, and a mile long list of random treks and tours you could choose from. Of course, we didn’t have anything planned, we just wanted to get up there and see our options. Well, we learned NOT to take the first hotel offer you get just because it’s cheap! Cheap in Thailand has a VERY wide spectrum. Needless to say, we weren’t impressed with our spontaneous choice. 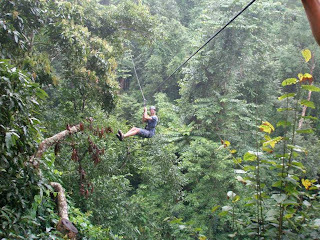 (hence we have no pictures of it) Although, we did instantly sign up for a "Flight of the Gibbon" zip-line tour through the jungle treetops. It was a swingin' time! Strapped into these unattractive harnesses, we were given instructions of what to do while being swung hundreds of feet above ground. Granted, our guide had terrible dialect and we only were able to catch half of what to do. SCARY but an awesome experience aside from the attack of the deadly mosquitoes!! As the Thais say, white people eat too much sugar so the mosquitoes like us, if we ate spicy food all the time, like they do, mosquitoes wouldn’t bit us. 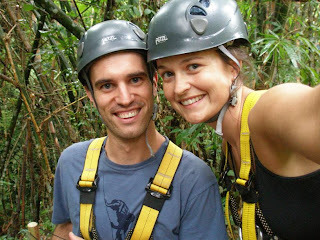 We swung from 11 trees, crossed 3 wooden sky bridges, and rappelled down 2 trees. An adrenalin rush for sure! The next day, we headed back up into the mountains and visited some of the hill tribe villages. 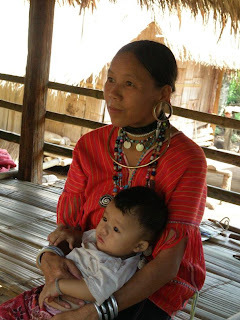 We got to see how the Longneck-Karen Tribes live, along with the stretched out ear tribe. It simply amazed us how these people live. Spending time there was an eye opener and really made us evaluate and appreciate all we have. I have to say though; these people liv e on some beautiful country side! 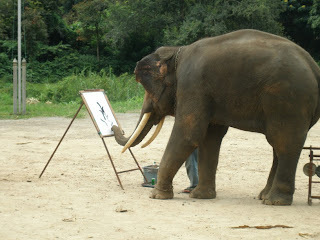 We saw amazing views of rice fields and mountains while riding on an elephant then got to see these amazing animals show us their talents by painting us pictures, showing us how they bathe and how their feces can make paper. 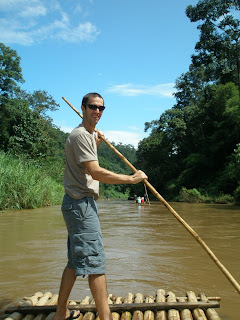 This sweaty day led us to the river where Daniel got to practice his 'helmsmanship' while taking us on a bamboo raft. The river was beautiful even if it was brown (that’s why we don’t drink it) At night we enjoyed the town by walking up and down the streets, some good restaurants, the Night Market, and time out of the city, Bangkok. We definately enjoyed our short visit north, and hope to return again….with hotel reservations and mosquito repellant!